Home » Posts Tagged "water storage tank"
I always get asked “why my new bathroom taps or mixers do not work as well as my old taps” well this is because in the UK there are very few true taps manufacturers most are simply importers and the products available on the market are not manufactured specifically for the low pressure market. So if you have a conventional water system with a cold water storage tank and a hot water cylinder in your airing cupboard then you will need to be careful with your product selection. 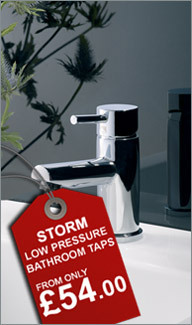 I like the way that tapstore.com explain about the high versus low pressure on their information pages which you can view here and the low pressure bathroom tap pages where they point out ranges with explanations that will work on a gravity fed water system. There are products that will work on low pressure well but always double check the products specified minimum specified pressure rating. The function of bathroom taps and mixers is so important if you make the wrong decision by the time you use your lovely new bathroom it could be too late the last thing you want is to wait 20 minutes to fill up a bath and by the time you get in it its cold, so take time and care in making the right choice.